Everyday Gourmet & Crepe It Up! | Mmm, Tasty! Everyday Gourmet & Crepe It Up! It’s been a busy month around here, which is why we haven’t been posting very much. Sorry about that! I’ve got a few things for you over the next week or two. Saturday morning we headed to St. Lawrence Market to check out the farmer’s market and do a little general shopping. While there we decided to have breakfast, since neither of us had eaten yet. I suggested we try both Everyday Gourmet (for coffee) and Crepe it Up (for a crepe or two). Everyday Gourmet had caught my eye the number of times I’d been to St. Lawrence Market. 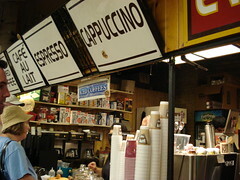 Inside you’ll find coffee beans from all over the world, many of which are organic and/or fair trade. They also roast many of their beans in-house, and the giant roaster off to the right side of the store always seems to be in use. We opted to get some of their Haitian Blue beans as well as some of their Guatemalan Decaf, both of which are fair trade. We also decided to each get a double espresso to go; a little something to sip while we waited for crepes. The espresso was quite nice, with a good crema and not too much bitterness. Not the best espresso I’ve ever had, but still lovely, and I’d be happy to go back and order another sometime. Crepes were one of Rich and my favourite foods when we were in Paris. They made the perfect lunch or late day snack, as they were filling, portable, and delicious. Crepe It Up had made BlogTO’s list of the best crepe places in the city, so I thought they might be at least somewhat comparable to our beloved French food. The menu at Crepe it Up is pretty long, offering a large variety of both savoury and sweet crepes. Along with the more traditional flavours like nutella, ham and cheese, and mushroom and cheese, they’ve also got all kinds of combinations with ingredients that sound like an omelette or stirfry rather than a crepe. We both opted to get the breakfast crepe, which contained an egg, cheese, peppers, onions, mushrooms, tomato and spices. This is served with a little side salad for just over $5. After we received our food we retreated to a small park near the market to eat and watch the crowds go by. 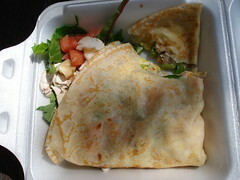 As you can see from the photo, the crepes here are not done in true ‘take away’ style like in France, but instead are served in your typical styrofoam container with the side salad. This means, of course, that you need both hands and a knife and fork to eat it. That’s ok, really, since the salad isn’t really portable food anyhow. How did it taste? Pretty good! The combination of fillings worked well together, the egg was nicely cooked, and the crepe itself was the right consistency and not at all rubbery. Next time I go back, I think I’ll try a nutella crepe. Everyday Gourmet & Crepe It Up! : St. Lawrence South Market, lower level. 92 Front Street East, Toronto.